^ R.E.Scouller, The Armies of Queen Anne, Oxford: Clarendon Press, 1966, pp.54-55. ^ Thomas Lediard, The life of John, Duke of Marlborough, Vol.1: Prince of the Roman Empire, London: Kessinger Publishing, 1743, pp. 122-127. ^ M. Bak, Bélá K. Kiraly, From Hunyadi to Rákóczi: War and Society in late medieval and early modern Hungary, New York: Brooklyn college press, 1982, p434. 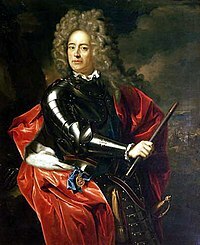 ^ John A Lynn, The French Wars 1667-1714 The Sun King at War, London,: Osprey Publishing, 2002, pp. 13-40. ^ Thomas Lediard, The Life of John, Duke of Marlborough Vol.1: Prince of The Roman Empire, London, Kessinger Publishing, 1743, pp.187-188. ^ William Coxe, Memoirs of John, Duke of Marlborough, with his Original Correspondence Vol.1, London, 1818, p184. ^ John Churchill Duke of Marlborough, Marlborough Godolphin Correspondence, Oxford: Oxford University Press, 1975, p133. ^ John Millner, A Compendious Journal of all the Famous Battles,Sieges,and other most note-worthy,heroical,and ever memorable Actions of the Triumphant Armies,of the ever-glorious Confederate High Allies,In their late and victorious War against the Powerful Armies of proud and lofty France,In and on the Confines of Holland,Germany and Flanders,so far as our successful British Troops extended in conjunction therein Digested into 12campaigns begun in A.D.1701 and ended in 1712,London: Naval& Military Press, 1733, pp.87-88. ^ David Francis,‘Marlborough’s March to the Danube, 1704’Journal of the Society for Army Historical Research, Vol. L. No. 202, 1972, p95-96. ^ David Chandler(ed. ), The Marlborough’s Wars－Robert Parker and Comte de Merode Westerloo, London: Longman Pub. 1968.